In collaboration with the Graduate Writing Service and the Office for Postdoctoral Studies, ELSO offers tutoring on writing, presentations, and pronunciation to all full-time matriculated international graduate and professional students and all post-docs. This tutoring is offered by trained peer tutors from a variety of fields, and takes place in ELSO's Tutoring Center (Caldwell Hall, room 260). The spring 2019 ELSO Writing & Presenting Tutoring Service schedule is now online. Pronunciation tutoring opens soon. We use My WC Online to schedule tutoring appointments. To make a tutoring appointment, click here. The first time you visit this site, you will be asked to register for My WC Online. You may bring any kind of writing: class assignment, research paper, email, job application materials, blogs, etc. You may bring any kind of presentation: class presentation, journal club presentation, conference paper, poster presentation, job talk, etc. And whether you are working on a writing project or presentation, you may come at any point in the process: from brainstorming to finalizing. You may request a single appointment to work on a particular paper or presentation, or a series of appointments to keep you moving forward with a larger project. Tutoring on writing and presentations takes place in ELSO's Tutoring Center (Caldwell 260). This program is coordinated by Dr. Nathan Lindberg (nathanlindberg@cornell.edu). For your initial appointment, you will need to make a diagnostic speech recording with your laptop or phone and bring this with you to your scheduled session. The diagnostic speech recording should be about 1-2 minutes. 1) Describe your first day in the United States. What did you do? What happened? What challenges did you encounter? What were your first thoughts? How did this compare with your expectations? 2) Describe and summarize a book or an article you've read or a movie you've seen. What happened? Would you recommend this to others? Why or why not? What were the main points or events? 3) Talk about a miscommunication experience you have had. What happened? Who was this with? Where? How did you respond? practice a mock job interview, deliver an oral presentation, defend a thesis, summarize a lab report, give a job talk, pitch your academic and professional interests, discuss your research, give a poster presentation, meet with advisors and faculty, etc. Within these contexts, you can focus on areas of pronunciation difficulty determined by you and the tutor during the intial appointment. Tutoring on pronunciation takes place in ELSO's Tutoring Center (Caldwell 260). This program is coordinated by Melissa Myers (mm177@cornell.edu). Appointments are for 45-minute sessions, which start on the hour. Appointments may be made up to 7 days before the scheduled session. Writing tutees are limited to one appointment per day and 2 appointments per week. Pronunciation tutees are limited to 2 appointments per week. Pronunciation tutees may cancel appointments up to 2 hours before their scheduled appointment time. A tutee will be marked as a "no-show" if he/she did not arrive for the appointment in the first 10 minutes of a session. After 3 no-shows, a tutee will be blocked from making more appointments and any scheduled appointments will be canceled. Tutees wishing to reinstate their tutoring privileges need to meet with Nathan Lindberg. Dr. Nathan Lindberg is the ELSO Tutoring Service Director. He has a PhD in Composition & TESOL and has worked with multilingual writers for more than 15 years. Nathan has helped students with their dissertations, theses, articles for publication, job application material, grant applications, and other genres. He encourages students to sign up for tutoring help at all stages, from brainstorming to proofreading. Andrea Mendoza is a graduate peer tutor pursuing her Ph.D in Asian Studies. For the last three years, Andrea has served as a teaching assistant in Chinese and Japanese Studies as well as a writing seminar instructor for the Knight Institute. Though her academic work is mainly in the humanities, Andrea has experience in workshopping applications, abstracts, presentations, and papers from across diverse disciplines. She conducts her dissertation research in Japanese, Spanish, French, and Portuguese and considers herself a multilingual writer and scholar. Andrew Gipson is a graduate peer tutor from the department of Molecular Biology and Genetics. He is currently serving as a teaching assistant for an introductory biology class, and has over five years of experience tutoring science. He is familiar with writing grants/proposals, research papers, personal statements and résumés. Brian Lo is a graduate peer tutor studying Nutrition. He has personal experience with proposals, presentations, and publishing research in STEM fields, and is trained to work with graduate students and post-docs from across the disciplines. He is fluent in English, Cantonese and Mandarin. David Dunham is a graduate peer tutor pursuing his PhD in German Studies. He earned his BA in German and Philosophy from New York University. Before coming to Cornell, David tutored writing to international ESL students from the middle school to graduate level. He has over three years of experience advising students on narrative essays, job application materials, research projects, and other assignments across several disciplines. Ekarina (Rina) Winarto is a graduate peer tutor pursuing a PhD in Linguistics. Her research specializes in syntax and sentence structure in different languages. She has taught German, Linguistics and Writing Seminar classes at Cornell, and has had some experience in film subbing, commercial and semi-legal translation as well as foreign language tutoring. With a background in medicine, economics, literature and linguistics, she is able to help with different kinds of writing assignments, journal publications and presentations in a wide array of topics. She is also fluent in English, Indonesian, German; conversational in Mandarin and Korean, and has worked with Japanese, Spanish, Arabic and Tagalog for her research. Hugo Milan is a graduate peer tutor pursuing his PhD in Biological Engineering. He has experience with grants/proposals, research papers, and presentations, particularly for Engineering and STEM fields. He was a finalist in the 3MT competition in 2018 (https://youtu.be/j-pYEQZNa7k) and was a presenter at SPARK Talks in 2017 (https://youtu.be/u-dBJb2aDDw). He is a native Portuguese speaker from Brazil and has basic Spanish skills. Mary Jane Dempsey is a graduate pronunciation tutor pursuing her PhD in Romance Studies. After growing up in New Jersey, Mary Jane spent the last years in Italy and the United Kingdom, where she both worked and studied. During this time, she was employed as an English teacher, writing tutor, translator and adjunct professor. In pronunciation class, she seeks to allow for an environment in which students can be comfortable and confident to take risks with their English. All of our tutors are trained to work with graduate students and post-docs from across the disciplines, to work on a variety of projects and challenges, and to work with writers who use English as a second language. Raashid Goyal is a graduate peer tutor pursuing his PhD in Near Eastern Studies. He has over five years' experience instructing and tutoring English and holds a Cambridge CELTA (Certificate in Teaching English to Speakers of Other Languages). Raashid is fluent in Arabic, his primary research language, as well as Hindi-Urdu, of which he is a heritage speaker. He also conducts research in Persian, Syriac, Hebrew, French and German, all of which he enjoys learning. He is available to help with all types of projects, including grant proposals, conference presentations, CVs and resumes, and papers from across diverse disciplines. Sarah Edelson’s return to Ithaca gives her the opportunity to share her love of clear and concise communication with others as a graduate peer tutor. After receiving her BS at the Cornell ILR School, she attended Penn Law and worked for over three years as a judicial law clerk and firm associate. 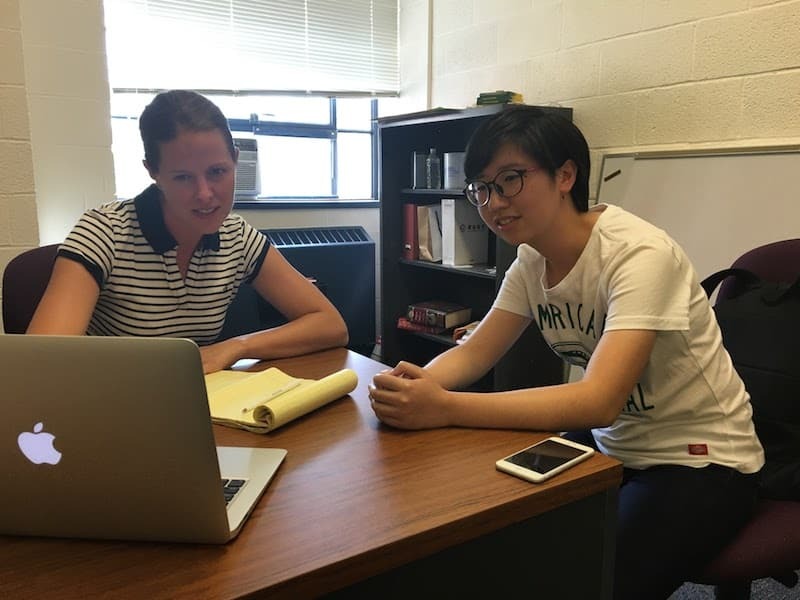 She subsequently served as the academic support coordinator at a high school in Philadelphia, and is now thrilled to pursue graduate study in Human Development back at Cornell as a first year PhD student. Sudan Kariuki is a graduate peer tutor pursuing her PhD in Ecology and Evolutionary Biology. She served as a peer writing tutor during her undergraduate studies, and has experience working across a broad range of disciplines. Her specialties include personal statements, essays, scholarship applications, grants, academic reports, and cover letters. In addition to English, Sudan is conversant in Swahili.